Mayor Garcetti announced six Great Streets, including Figueroa pictured here, that will become more accessible to wheelchairs, pedestrians, strollers and bicycles. photo Flying Pigeon L.A.
Mayor Garcetti gave his first State of the City speech yesterday. The mayor touched on a number of transportation issues. He pledged to “bring rail to LAX” and to open the 405 Freeway’s new billion-dollar carpool lane “next month,” a bit earlier than its October 2014 projected completion date. The most detailed transportation news was a peek into some of the specifics of Garcetti’s Great Streets initiative. Garcetti named six of what will be 15 selected streets: Crenshaw Boulevard, Figueroa Street, Gaffey Street, Reseda Boulevard, Van Nuys Boulevard, and Westwood Boulevard. Apparently the focus for now is entirely north-south streets. Here’s how it works. We’ll saturate your street with services. We’ll make your street accessible to pedestrians, wheelchairs, strollers and bicycles–not just cars. We’ll create an environment where new neighborhood businesses can flourish. We’ll pave the streets and make them green streets — clean and lush with plant life, local art, and people-focused plazas. I know this works because I did it in my old council district — in Atwater Village, Echo Park, Silver Lake, and Hollywood. Focused improvements attract new cafes, help local businesses expand, and give people a great place to gather without getting in their car. I’m pleased to announce today that the first 15 Great Streets will begin to roll out this spring. On Reseda Boulevard next to Cal State Northridge, we’re going to create a place for town and gown to come together. On Gaffey Street in San Pedro, we’re going to join forces with its burgeoning creative community. We are going to bring back the glory days on our storied Crenshaw, Westwood, Figueroa and Van Nuys Boulevards. There’s a lot of potential on the mayor’s initial six streets, but many of these have also been host to livability struggles. This comes as no surprise, because great commercial streets are popular. Everyone – from pedestrians to drivers – wants to be there, so there’s competition for space. Here’s Streetsblog L.A.’s quick preview of these six streets. Crenshaw Boulevard – Crenshaw extends north-south from Wilshire Blvd through South Los Angeles. Construction is underway on Metro’s Crenshaw/LAX rail line, expected to open in 2019. The boulevard is also the subject of future plans that could soon move into implementation phases: the Crenshaw Boulevard Streetscape Plan and possible connections with the Slauson corridor’s Rail to River. Figueroa Street – Figueroa is one of L.A.’s longest streets, extending all the way from Eagle Rock to the Harbor. Bike lanes planned to revitalize North Figueroa have been contentious; advocates are already organizing for community meetings coming up in May. Further south, the MyFigueroa complete streets makeover has stumbled, but appears to be poised to proceed to construction later this year. The mayor’s speech took place on Figueroa – at the California Science Center, one of MyFigueroa’s vocal opponents. Gaffey Street – Gaffey is a main north-south artery for San Pedro. Though it’s a commercial corridor, much of it a historic main street, stretches of it suffer from being treated more or less as an on-ramp to the 110-Freeway, especially during rush hours. Reseda Boulevard – Reseda is a main north-south street for the San Fernando Valley, connecting with Cal State Northridge. Though its implementation was contentious, the boulevard now features a continuous 10+mile bikeway, mostly bike lanes – including a couple blocks where parking was removed – with a few short stretches of sharrows. Van Nuys Boulevard – Van Nuys is another great north-south San Fernando Valley artery. It’s currently the subject of Metro’s East San Fernando Valley Transit Corridor study. Westwood Boulevard – Westwood Blvd extends north-south from UCLA to National Blvd. At times, the Westwood neighborhood has been a thriving commercial district, but parking, arguably mismanaged, has long been contentious. Westwood Blvd will see a new Expo Line Station open in 2015, but Councilmember Koretz, caving to shortsighted neighborhood opposition, put planned Westwood Blvd bike lanes on hold. SBLA looks forward to seeing how the mayor’s intiative translates into on-the-ground livability improvements in the coming months. I asked that question – and didn’t get a response yet. I’ll post here if I hear back. What are the bets for the rest? Wilshire? SMB? Sunset? Hollywood? Pico? Expo? Venice? Abbot Kinney? Victory? Will they manage to find anywhere in South LA? I would say Sherman Way and/or Ventura would be the best candidates for East-West in the Valley. Victory doesn’t have much in the way of on-street businesses. Just malls and mini-malls with parking lots as far as the eye can see. Sherman Way and Ventura have more “on-the-street” businesses like Reseda and Van Nuys (speaking generally I think… I could be wrong). Fig and Crenshaw seem redundant–these already have plans that should be implemented if the city does its job right. Van Nuys is fine, but if Metro does it’s job right, it should be ripped up in a few years for transit. Westwood is awkward since Koretz already killed “Great Streets” improvements. Gaffey and Reseda are cool, I guess. Let’s hope Vermont and some of the other real crapshoots are in the full program. Furthermore, I was always under the impression that the Great Streets program was going to focus on specific segments of each of these streets. I’m assuming that he’s going to name a specific mile, or a few specific half-mile segments, on each one of them. But perhaps there will be some minor improvements along the entire length, in addition to very focused major improvements. It doesn’t sound like Mayor Garcetti intends to focus resources on the entire length of a street. That would be too daunting a task for a city that is fiscally constrained to repave the entire street, fix the sidewalks, plant trees, etc. He mentions Reseda Blvd where it borders Cal State Northridge. That’s about a mile and a half in length. I’d have to assume he means only Westwood Blvd north of Santa Monica Blvd, and next to UCLA, where it used to have a thriving business area filled with pedestrians going to restaurants, etc. South Figuera St. next to USC is in the bag with $20 million going towards the My Figueroa project. Van Nuys Blvd poses a problem with the East San Fernando Valley Transit Corridor project that Metro will be constructing. If Metro decides to install either a brt or light-rail each would consume 2-1/2 lanes worth of width. The half involves narrowing the sidewalks where the stations would be located. Metro could also decide to simply put bus only lanes next to the curb since they have a very limited budget to work with. In any scenario submitted so far by the consultants, a bicyclist is expected to either ride in the middle of a motor vehicle through lane or a bus only lane. Installing bike lanes would involve the city deciding to remove curbside parking. That would be extremely unlikely to happen. The uncontested parts for the Great Streets will be repaving the street, fixing the sidewalks, installing foliage and planting trees. What’s in question is whether Mayor Garcetti will put in bike lanes in areas such as Westwood Blvd where the community stakeholders have so far rejected them. Or perhaps he will capitulate and install sharrows instead. A busy arterial street with sharrows would not be a great street for bicycling. The accessibility for bicycles would be limited to the less than one-percent of the adult population who are traffic tolerant. The intersections for the Orange Line brt and mixed use path has taught me that there is a very distinct hierarchy for transportation in this city. Motor vehicles have priority over transit, then pedestrians, and the lowest is bicycles. Putting a major transit line down Van Nuys Blvd which would eliminate any possibility of a bikeway would likely get overwhelming community support, especially a very expensive rail project. That would effectively put any thought of a bikeway on Van Nuys Blvd in the dustbin of history. Afterall, bicycling has the lowest priority for transportation. Even though its likely to gain more commuting mode share in the next few years in Los Angeles than transit even with the major rail line installations. For example, Gaffey Street is at the end of 110 Freeway. No matter how much money one spends on that street, it will still be at the end of the 110 Freeway and the primary auto and truck corridor into and out of San Pedro. We can spend tons of money to make it prettier for motorists, but for a fraction of the cost, we could make 6th St and 7th Street in San Pedro–which have much better “bones”–a great walkable commercial district. Likewise, it is very hard to imagine many people walking along Reseda Blvd near Cal State Northridge. People should take a look at Yucaipa Street between 2nd and Bryant in Yucaipa. One of the most fantastic “complete streets” designs I’ve ever seen. Due to its location, it also strikes me as doing very little to actually attract pedestrians. I live in San Pedro and the 110 freeway south empties onto Gaffey street. The street is always busy. I’ve never seen a bike on Gaffey street south of the 110 harbor freeway. Probably because there are no bike lanes and the traffic there is always heavy. If the plan is to make Gaffey st. accessible to bikes, then they are going to have to reduce the number of lanes. I want to second what AJ said. How is the Westwood segment going to work with to “give people a great place to gather without getting in their car” when the main bicycling improvement was rejected by the council district? That example gives me pause to think how this Great Streets effort from the Mayor’s office will play out since the individual council members have so much power over their district. I sincerely hope that the improvements on Westwood Blvd aren’t just about the performance parking effort, ExpressPark expansion, which was already planned, but a more holistic look at mobility and access in Westwood village. Maybe this is a chance to re-open the Westwood bike lane discussion? (I say that, but am not too hopefull.) Sorry to be out of the loop, but what’s the ExpressPark stuff? Could you post a link to something explaining that? I share your concerns and interest too. I was disappointed by CM Koretz’s decision to kill the Westwood Boulevard bike study. It was a cowardly decision. I would be interested in supporting improvements in Westwood Village AND at the corner of Westwood and Wilshire. That intersection carries a lot of cars AND pedestrians. It is also a hazardous place to cross. It could use a lot of things, including a pedestrian island. It is a critical linchpin between the workers and residents who live south of Wilshire and a retail district that needs their patronage. From my understanding, a lot of the vacancy in Westwood relates to the years old Specific Plan that caps “fast food” but that fast food evens is extended to places like Tender Greens so restaurants that may be interested in moving into the district have this huge barrier because of the specific plan. Will the Great Streets Initiative address this? There is a round two of proposed 40 miles of bike lane installations that will be presented to community members. One of these batch of streets involves Westwood Blvd from Le Conte Ave to Wellworth Ave. These bike lanes would connect the existing bike lanes on Westwood Blvd to the bike lanes on Le Conte Ave.
One of the major differences between this area of Westwood Blvd and the proposed bike lanes that were rejected by the community from Santa Monica Blvd to National Blvd is the amount of people who walk to work. In contrast, the two zip codes directly south of there from Santa Monica Blvd to National Blvd have walking mode shares from 2%-4%. Metro is proposing a peak hours only Express bus line that will pick up park and ride passengers at the two large parking lots at the Van Nuys and Sepulveda stations–1,981 mostly unused parking spaces–of the Orange Line. The passengers will then be driven on the upcoming HOV lane of the 405 to Westwood Blvd just above Wilshire Blvd. This could limit the stops in the San Fernando Valley for those heading to UCLA to only three. This would be a very direct route that would be relatively fast, making a bus commute much more attractive. The bus route has the potential of reducing car trips by hundreds during peak hours on Wilshire Blvd and Westwood Blvd. This should heighten the appeal of taking away a motor vehicle lane to install bike lanes. I think Maddie is right. The specific plan makes a distinction between fast food and table service. Nonetheless it has not boded well for Westwood. There is a sufficient volume of workers in Westwood to keep restaurants afloat. The restrictions stymie the location and quantity and types of restaurants that can come to Westwood to replace those whose concepts or service didn’t pencil out. 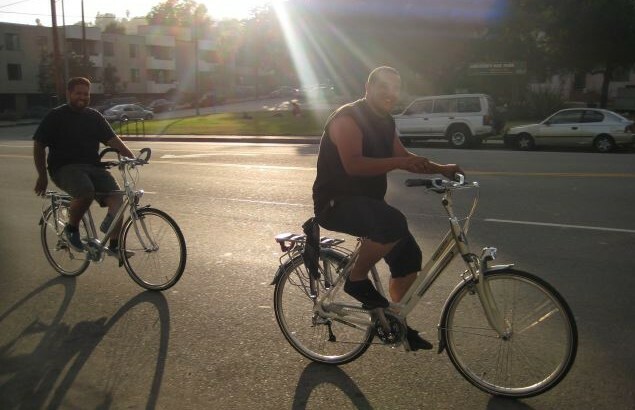 As far as improving conditions for biking in and around Westwood Blvd. focusing solely on just the boulevard itself seems too narrow a thought process. The neighborhood community which Joe characterizes as short sighted (an opinion which I feel is unfair but not surprising reading this blog over time) was actually trying to take into account the large number of variables which come into play when touching Westwood Blvd. in any way. The focus on shoe horning a bike lane onto Westwood independent of its affect on the surrounding community could also be characterized as short sighted. I hope the Mayor has a wider scope of vision with his announced initiative. Since there are numerous, neighboring streets paralleling Westwood Blvd, there are clear (and in many people’s opinions, superior) alternatives to route bike traffic through the neighborhood streets instead of down Westwood Blvd. itself. That would make a great, bike-able community for both riders wishing to access to the shops along Westwood (via east/west streets such as Tennessee or La Grange), the small percentage of commuters willing to take on the 2.5 mile uphill climb from the Expo station to UCLA, and the local residents (including numerous children/teenagers) who may just wish to go for a pleasure ride, take their bike to school or music class, or perhaps visit a friend’s house a few blocks away. Re-stating for emphasis, my opinion which I’ve found is shared by many (including regular bike riders) is that a continued focus on “bike lanes on Westwood” is narrow minded. From many, common sense viewpoints, such lanes would probably only be viable for the very dedicated, sophisticated riders who are willing to take on the heavy auto/bus/truck traffic, and complex intersections along Westwood Blvd. as a “cause” rather than a practical, real world upgrade the the local area’s quality of life. Taking a step back from the bike lane cause to see the larger picture would be a refreshing change which I hope the mayor will make. The main entrance for the 73,000 students and employees of UCLA is Westwood Blvd. Whether your walking, taking a bus, driving or bicycling, the obvious street that the vast majority of these people would want to use for getting to and from UCLA is Westwood Blvd. Trying to divert bicyclists to less direct routes along residential streets would not make great strides in making bicycling more useful for transportation to and from UCLA. People who use bicycles have destinations and time schedules to get somewhere just like everyone else. If Westwood Blvd from Le Conte Ave to Wellworth Ave does not get bike lanes that would connect to the existing bike lanes to the south, then in no uncertain terms this section of Westwood Blvd would be only useful for bicycling to those that are traffic tolerant. That is less than 1% of the adult population according to a survey from the city of Portland. This would make a unmistakable statement that if you want to travel to and from UCLA on the road of Westwood Blvd you should choose driving since this would be the most direct and fastest way to get there. The basis of this type of reasoning that encourages more driving seems to be that there is plenty of room to accommodate an ever increasing amount of cars on Westwood Blvd in this area not only in the short term, but also in the long term. This would be shoehorning more cars into this fixed amount of road space by encouraging people to choose driving over other forms of transportation. People will choose the type of transportation that provides the fastest and easiest way to get somewhere. Providing a circuitous route for bicycling to and from UCLA will not make bicycling more appealing over the more direct route of driving along Westwood Blvd. Cities in the U.S. where high percentages of the population are college students have the largest percentage of commuters who bicycle. The two highest bicycle commuting modal share cities are Davis California with 20% and Boulder Colorado at 10%. USC has a overall 14% modal share for bicycling for the workers, faculty and students. A high commuting modal share for walking in an area indicates that the distance from residences to work is short. Bicycling can extend that distance since you can bicycle three times further in 30-minutes than you can walk. The zip code that encompasses Westwood Blvd from Le Conte to Wellworth Ave is 90024. Its boundaries are Veteran Ave on the west, Sunset Blvd on the north, Santa Monica Blvd on the south and Whittier Dr on the east. The rate of commuting to work by walking for zip code 90024 is 30.7% per the Census Bureau. This strongly indicates a large increase in bicycling would occur if bicycle lanes are installed on Westwood Blvd. First of all, who are you, Craig? Clearly not one of the “small percentage of commuters” who you refer to. Well I am. I can tell you that, while it is a climb to UCLA, that is not the main deterrent for people who are interested in commuting on a bicycle. It’s the cars, specifically the lack of separation from them. I drive, bike, and ride the #12 bus. I support bike lanes from National to LeConte. I cannot fathom why you do not, other than fear of change.